Just this past week, I found changes on the Swarovski.com website with respect to the Lovlots community. Yesterday, I did a post on the Happy Ducks joining the Swarovski Lovlots group. But they are not the only new members…. Swarovski Kris Bears have also moved into the Lovlots community. Previously, the Kris Bear figurines were used in at least 2 different product lines: Crystal Moments and Silver Crystal. In early 2012, additional Swarovski Kris Bear figurines are expected to be released. Swarovski Kris Bear on Skis – two variations, modified to create steadiness standing. Swarovski Kris Bear Bride and Groom – frequent name changes and new coloring change. Swarovski Halloween Kris Bear – first holiday limited edition Kris Bear. I think it would be cool if the Swarovski Kris Bears resided in “Kris Bear Castle” in the Lovlots city. Or perhaps a wooded area distanced away from the “city”. I hope the crystal brand keeps the district-theme alive with the new placement of the Lovlots Happy Ducks and now the Lovlots Kris Bears. So, here is another change that is coming up on the Crystal Exchange America website. Presently, the Kris Bear figurines are in the scattered throughout the site…the best way to find them is using the search feature of the site. Very soon, these Swarovski crystal Kris Bears will become easier to find in a central location, the “Lovlots & Zodiac” category. The crystal critters have made another public appearance… Missy Mo and Kris Bear have finalized their costume choice to wear Trick or Treating on Halloween night. And of course, the paparazzi was there for the big announcement! The shot below shows Swarovski Kris Bear and Swarovski Missy Mo dressed and ready to go. The Swarovski crystal figurines revealed that they will be going out as Santa and his Elf Kris. Missy Mo is decked out in a red Santa suit. Kris will be carrying a Christmas tree, just as every good elf would do. The Swarovski Santa Mo is a limited edition figurine available only in 2011. This Lovlots limited edition figurine and can be purchased in the Swarovski store at a cost of $65. It can be identified as Swarovski article numbers # 9100 000 336 / 1096024. The Swarovski Christmas Kris Bear (2011) limited edition figurine available only in 2011. Christmas Kris Bear is a delightful bear figurine carrying a traditional holiday tree. This limited edition Kris Bear figurine and can be purchased in the Swarovski store at a cost of $100. It can be identified as Swarovski article numbers # 9400 000 315 and # 1091815. Swarovski Santa Mo can be found at Crystal Exchange America website: www.CrystalExchange.com . Look in the ‘Limited Edition Swarovski’ category of the store to find it and other limited edition Swarovski Mo Cows. Swarovski crystal fanatics should stay tuned to the Kristall Buzz to see what mischief Kris and Missy will be into after they collect and munch on all their candy! Well, my petite crystal friends have slipped out once again. My Swarovski figurines, Missy Mo and Kris Bear have been back in action, and the paparazzi have captured more photographs! Mum is the word, but the Swarovski crystal figurines told us they are getting ready for a job interview! A job? It appears this is a package deal…they both want to work together going on a joint interview. I can hardly believe that my little Swarovski figurines want to do more than stand pretty in my crystal cabinet? This photo shows Swarovski Kris Bear and Swarovski Missy Mo dressed and ready to go. It’s obvious where they are headed…to the local florist. Missy Mo showing off her green outfit decorated with flowers things, just like guess who? Of course Swarovski Flower Mo! Kris Bear is making an impression with his green thumb. The Swarovski Flower Mo was a limited edition figurine available only in 2009. This Lovlots crystal figurine can be identified as Swarovski part # 9100 000 174 and system # 1 027 911. While it originally retailed for $55, it now commands prices of $250 to $350 in the online auctions and in the secondary market. Our Kristall Buzz article on Swarovski Flower Mo in March, 2011, documents how the prices on this Lovlots figurine have been on the rise. The Swarovski Kris Bear Especially for You is an adorable bear figurine proudly holding a giant sunflower. It was introduced in 2005 and can be purchased in the Swarovski store at a cost of $100. This crystal figurine can be identified as Swarovski part # 9400 000 062 and system # 842 934. Swarovski Lovlots Flower Mo can be found at Crystal Exchange America website: www.CrystalExchange.com . Look in the ‘Limited Edition Swarovski’ category of the store to find it and other limited edition Lovlots Swarovski Mo Cows. I completely believe in privacy, so I’m not real big on the paparazzi activity. However, I love these photos of Kris Bear and Missy Mo that they have been providing to us! Swarovski crystal fanatics should stay tuned to the Kristall Buzz to see what interesting photos may surface next! Apparently, my little Swarovski figurines are still sneaking away when I’m not paying attention to them. My crystal friends, Missy Mo and Kris Bear have been spotted by the paparazzi again. The Swarovski crystal figurines quietly told us they are still checking out Halloween costumes. It seems clear that the two are looking for the perfect outfits for the trick or treat occasion. In this photo, Kris Bear and Missy Mo are complimenting each other in their traditional western farming attire: Missy Mo dressed up like a cow of all things, and Kris Bear sporting a cowboy outfit, complete with a ten-gallon, old-fashioned blue handkerchief, hat and lasso. The Swarovski Johnny Kris Bear is not available at the moment, but would be found in the category “Crystal Moments”. 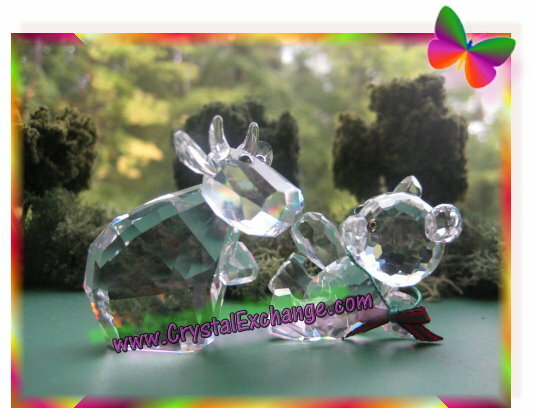 This crystal figurine, Swarovski part # 9400 000 111 and system # 883 413, was not available for long from Swarovski….it was introduced and retired in 2007. While only one of the Country Mos cows was pictured, they were actually sold as a set of two. 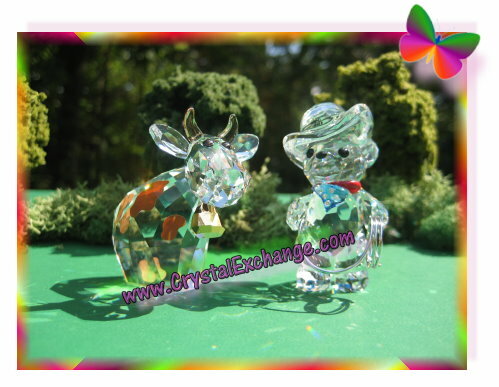 These Swarovski cows (Swarovski part # 9100 000 269 and system # 1 056 681) were only available in 2010 for a retail price of $105. This Swarovski Limited Edition set is part of the Swarovski Lovlots family. Now, where will Kris Bear and Missy Mo be spotted at next! Stay tuned to the Kristall Buzz Swarovski Blog for further updates on this unlikely couple! In 2006, Swarovski introduced a pair of crystal figurines resembling a bride and groom. They were called Kris Bear – You and I. This product was a pair of clear bears with a tad bit of crystal accents. In 2011, Swarski has modified the bride and groom figurines to include more colored accents. This new pair of bears was launched under a different system number. This was nice for Swarovski crystal collectors in that there would not be two different variations to be catalogs under the same Swarovski identification numbers. 2006 figurine (right): kakadu red crystal with peridot and jonquil crystal bouquet. (In English, that it pink and light green). The bride is also wearing a clear headpiece. Swarovski system number 842936. 2011 figurine (left): violet crystal with amethyst crystal bouquet. The bridal headpiece is also violet. Swarovski system number 1096736. 2006 figurine (right): Montana crystal bow tie. The groom is sporting a clear top hat. Swarovski system number 842936. 2011 figurine (left): light sapphire satin crystal bow tie. The groom is sporting a light sapphire top hat, however it appears to be a different color since the crystal hat component is much larger than the tie component. Swarovski system number 1096736. This gleaming couple has also undergone several name changes in the course of availability. 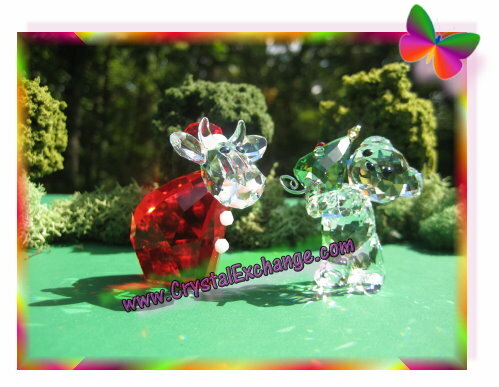 When the 2006 crystal figurines were launched, they were known and “You and I”. The couple held this name until 2009 when it was renamed “Bride and Groom”. Now, in 2011 the most clear figurines have taken on their original product name of “You and I”. The more colorful couple is presently known as “You and I”. The most clear Swarovski You and I figurines are no longer available for sale on the Swarovski web site. Being out of stock, and with a new version of the pair released, this likely means the original ones are retiring in 2011. The more colorful Swarovski You and I figurines are available on the Swarovski web site. They also retail for $165, the same price tag as their predecessors. I personally like the name “Bride and Groom”. I think it is helpful to have a product easily associated with the product name. For Swarovski crystal fanatics who prefer the original figurine, look quickly for stores who may have older stock of the original “You and I”. It may not be too late to find them at this point. Make sure you confirm with retailers the description and Swarovski identification numbers of the item you want. Also, you will want to be certain that you receive the box with the proper identification number on the label so that you know you have original and correct packaging. Who would have thought that my little Swarovski figurines were chit-chatting away in my crystal cabinet while I was sleeping, or perhaps, even sneaking out when I’m not home? Apparently, Swarovski Missy Mo and Swarovski Kris Bear are friends …I’m glad they are happy! And our little crystal friends are not exempt from the paparazzi either. Kris Bear and Missy Mo were recently spotted at a secret location, of all things, trying on costumes to go trick or treating! Missy Mo was trying on an orange outfit, sporting a black cow bell. Kris Bear put on devilish orange horns and is carrying his jack-o-lantern bucket for candy. Swarovski Missy Mo is a member of the Swarovski Lovlots Pioneers group. 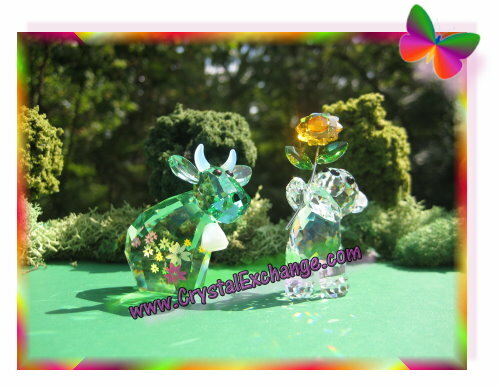 This crystal figurine introduced in 2005 and remains in the current product offerings. 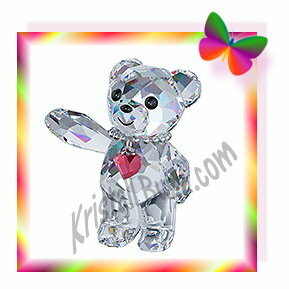 Swarovski Kris Bear was a part of the Silver Crystal product line. It was produced from 1993 to 2001. Swarovski Halloween Mo is also a member of the Swarovski Lovlots group, however, it is a limited edition available only in 2009. Swarovski Halloween Kris Bear is a brand new 2011 introduction, and a Swarovski limited edition 2011 figurine as well in the Crystal Moments product line. Crystal Exchange America has a virtual inventory of Swarovski Kris Bear, and Swarovski Halloween Mo. The Swarovski shoppe has the Swarovski Missy Mo and Swarovski Halloween Kris Bear available. Swarovski Limited Edition Halloween Kris Bear now as it just went online about a week ago. It is a limited edition for 2011, so. get yours quickly as supplies are limited. Now, I can’t help but wonder who else are friends and what else is going on in my crystal cabinet! Swarovski Halloween Kris Bear going Trick or Treating! 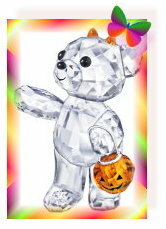 It seems that Swarovski is releasing a Halloween companion for Swarovski crystal collectors….Halloween Kris Bear! The news on an authorized retailer site that Halloween Kris Bear will be a Swarovski Limited Edition for 2011. This Swarovski Trick or Treat Kris Bear is cute. He is a clear crystal figurine, sporting orange-colored devilish horns, and carrying a matching colored jack-o-lantern to collect plenty of candy. The Swarovski system number is 1096026. It seems that the retail price of Halloween Kris Bear will be $95 – $100 USD. Halloween Kris Bear joins approximately 35 other Swarovski Kris Bear figurines released since 1993. About 7 of the Kris Bear figurines are current and can be purchased directly from the Swarovski shoppe online. For the retired or discontinued Kris Bear figurines, crystal collectors can find many available on the Crystal Exchange America web site using this link: Swarovski Kris Bear . I’m looking forward to seeing the new Swarovski Halloween Kris Bear in person. I bet he’s adorable! I’m wondering if in 2012, we might see another Limited Edition Kris Bear dressed in a different costume!